1) Cut a piece of vellum paper to your desired size and choose a line-art stamp image that gives you a defined area for coloring. 2) Stamp your image in VersaMark or Basic Black Craft ink. 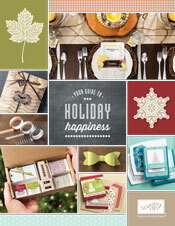 Heat emboss the image with Black or Clear Stampin' Emboss powder. 3) Flip over the vellum paper and color in the image using Stampin' Write markers or Watercolor Wonder Crayons. If using the crayons, blend colors with an Aqua Painter or blender pen. 4) Attach finished piece (embossed side up) to your project. Christmas Banner from the Builder a Banner Kit- Class coming up! Remember how I showed you the Holloween Banner? Well this banner is using the same kit but with Christmas Style! All you do is use the left overs from your Build a Banner kit ..order the Christmas Accessories kit and off you go to creating another beautiful decoration for Christmas. Here is what you will need? "If stamping techniques are your passion then the Swallowtail background stamp is a must-have investment! 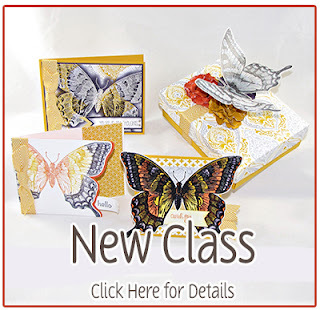 So come to this class and you will receive your very own Swallowtail Stamp and I will step you through four projects which will teach you 6 Swallowtail Techniques (Designer Series Paper Emboss Resist, Tri-color Watercolor Stamping, Stamping on Vellum, Blender Pen Emboss Resist, Follow the Edge Card, Illusion card, & Paper Flowers . Want to sign up? Click the picture above and you will be taken to my event sign up page. Can't make the class or live too far away? Let me know and I will set you up with a kit with step by step directions. You can pick the kit up after the class date or I can mail the kit to you for an additional $5.00. Please note that you may have to purchase additional inks to complete at home. Please RSVP by September 9th. Oh and if you already have the Swallowtail Stamp - Kit and step by step directions available for $10.00 plus shipping or directions only (no kit) for $5.00. Directions would be emailed to you after receipt of payment. So email me if any of these items are of interest. Want to earn Hostess Dollars but don't have a $150.00 Order? August Hostess Awards Code -3BZCN6AC - Last chance to order is August 31st. Here is how the Hostess awards are going to work. Every two weeks I am going to post a Hostess Code. If your order is less than $150.00 then you will use the Hostess code during the ordering process. I will then place all the names of the folks who ordered using the same hostess code in a hat and the lucky winner will receive the Hostess awards. This could be $25.00 or more depending upon how many folks order. Remember if your order is over $150.00 you will want to go straight to my website and place the order not using the Hostess Code. This way you get the hostess benefits during the order. Then click on the Shop button located in the upper right side of my home page. If you have questions let me know. Otherwise have fun and good luck. Every year at Halloween I love to give all of my nieces and nephews a treat, and it’s always wrapped up especially for them. Since the August “Best of” stamp set is “Best of Halloween,” it’s the perfect opportunity for me to get started early this year. You can read more about our “Best of” stamp sets here (US). I love that there are three main images, a border, and a greeting in the stamp set. Since the main images are about the same size, it was easy to come up with a design that worked for all of them. I used the new Decorative Window Gift Boxes since they are small and all of my nieces and nephews are still very little. I didn’t think they needed much more candy than these hold! Got any fun ideas for Halloween gifting? Tell me about them in the comments section below! 1) Stamp image in lighter color; this will be the shadow. 2) Stamp image in darker coordinating color slightly off the first image to create main image. 1) Stamp image in VersaMark ink on dark card stock. 2) Stamp image a second time in Whisper White Craft ink slightly off the first image. 1) Stamp image in VersaMark ink on dark card stock, and let dry. 2) Rub the Embossing Buddy over your card stock, and then stamp image a second time in VersaMark ink slightly off the first image. Cover with Clear Stampin' Emboss powder and heat emboss. This technique can be also be used with Stampin' Around wheels.